Mix the dry ingredients (flour, sugar, salt, yeast). Add water until it forms a dough and knead for about 8-10 minutes. 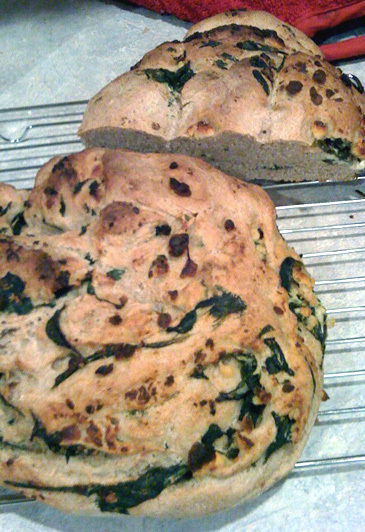 Let the bread sit for about five minutes, then kind of fold the spinach and feta into it. I’m not going to lie, this is tricky, it makes kind of gross noises, makes the dough too wet and difficult to knead. Just do the best you can with it – it won’t take too long. Put dough in an oiled bowl, cover with a towel, and let it rise for about two hours somewhere warm/humid. Punch the dough down, cut in half, shape into two loaves . Let it rise again for 40-60 minutes. Score the top of the bread. Preheat oven to 425. What I did was preheat the oven to 350, bake bread for about 18 minutes, realize the recipe called for the oven to be at 425 and change it, then bake for an additional 16 minutes at the new temp. That worked well enough. I did the pan in the bottom of the oven trick to make a nice crispy crust. 1. It is not a sandwich bread, exactly – there’s no fat in it, which means it will go stale relatively quickly. 2. I ran 10.5 miles today and I’m exhausted, therefore I’ve forgotten what #2 is. If it comes back to me, I’ll let you know. If I were doing this again, I would probably more like to let the dough rise sans spinach/feta, roll it out, fill it with the veg/cheese, roll it up like a log, and then do something with it – either cut the roll in half and bake each half in a pan, or braid them together, or cut them like cinnamon rolls and bake them close together like monkey bread…just something to get around the awkward problem of distributing cheese within already-kneaded bread. But it does smell/taste amazing. Nice blog! I may have to try that blueberry tart of yours. I’ve added a photo (I took it with my iPhone, so not the greatest picture ever). Enjoy!